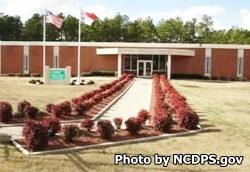 Hoke Correctional Institution is located in Raeford North Carolina. It is a minimum custody prison that houses 502 adult male offenders. This prison has both open dormitories and single cells for inmates. Offenders in the North Unit are housed in a dormitory and provide labor for the Department of Transportation. Inmates in the South Unit are primarily short term and only housed at the facility a short period of time. Central Unit houses general population inmates. Additionally, Central Unit houses segregation and protective custody inmates in 24 single cells.